3 X 10 Stamped Steel Floor Register - White Discounts Apply ! 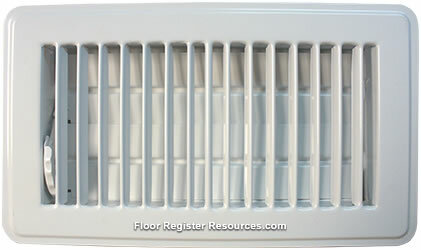 White vent covers feature a powder coat finish for scratch resistance. The 3 x 10 floor register is made of all steel construction for added strength. This white vent cover has a steel damper that is easily adjusted with your foot. Your 3 x 10 floor register offers simple one step drop-in installation. White vent cover comes in a classic style suitable for most tastes of decorating. 3 x 10 floor register is quality made for a great price. ***Hint: The industry standard is to order white vent covers using the actual hole opening size and not the faceplate size. This classic white floor register will fit a 3 x 10 inch hole opening. 3 x 10 Floor registers aren't your only option; there are several sizes available and also a neutral tan finish. These white vent covers are a great way to update the look of your home without breaking the bank; place your order today!